# You should modify 1024g to the size of your maximum Time Machine backup size. It is a good practice to create a special user specifically for network drives that will be used for TimeMachine backup. On MacOS X versions prior to 10.6.3, this step would be not necessary, but on latest versions TimeMachine automatically resizes your sparse bundle to occupy the whole space. We’ll deny it using access rights hack. To be able to continue, you should access your NAS using root credentials. Warning: Permanently added 'nas,192.168.1.227' (RSA) to the list of known hosts. 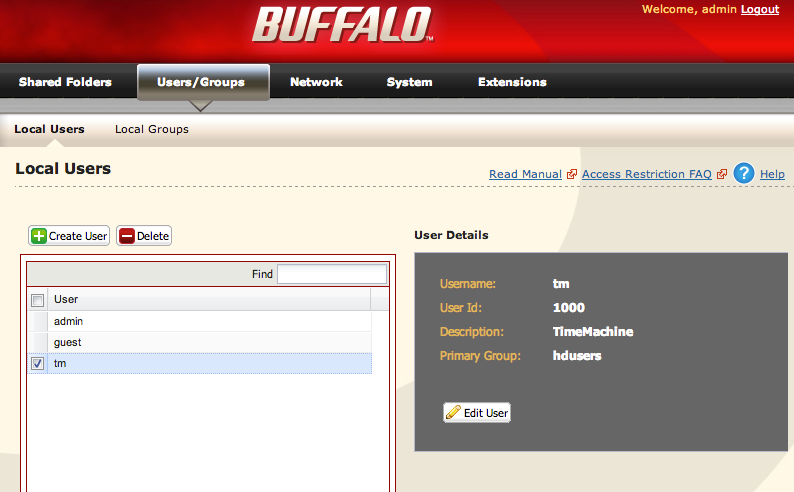 The last step is to configure TimeMachine to backup to network disk. It’s the same process as with usual hdd. 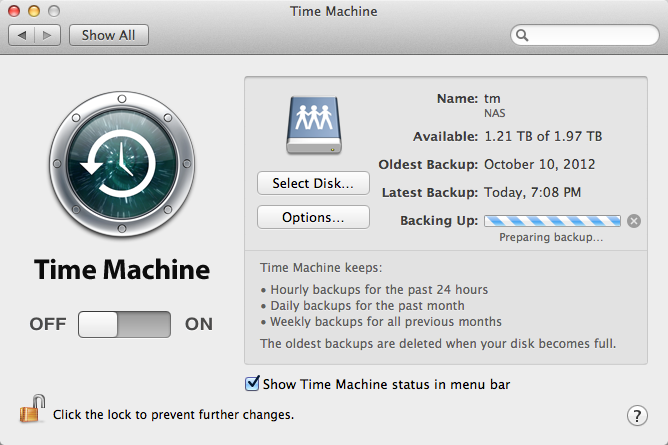 Once TimeMachine is configured, let’s verify that it is backing up normally and will not occupy the whole disk space. 10/9/12 8:40:57.454 PM com.apple.backupd: Backup verification passed! 10/9/12 8:41:01.117 PM com.apple.backupd: Ownership is disabled on the backup destination volume. Enabling. The message we’re most interested in is com.apple.backupd: Could not resize backup disk image (DIHLResizeImage returned 35), which means that our access rights hack worked and TimeMachine will be limited by 1024GB.